What is a beautiful gold necklace without a breath-taking gold pendant? 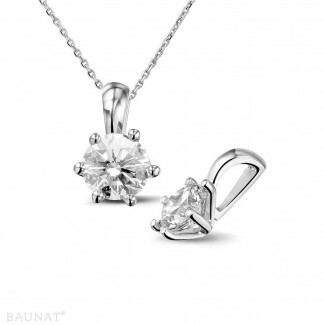 That’s why BAUNAT can offer you an extensive choice of gold diamond pendants to complement your necklace. An extensive collection with something for everyone. Which gold pendant would you prefer? Why opt for a gold diamond pendant? The diamond symbolises eternal love, purity and indestructibility. 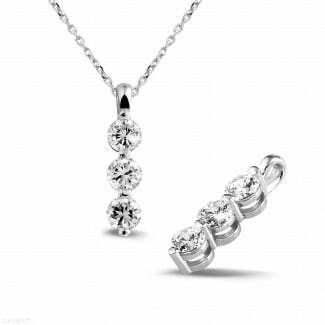 A gold diamond pendant is therefore ultimately suitable as a gift for a loved one. You can choose from various different styles. For example, you could go for a gold pendant with one single diamond, or a trilogy pendant with three diamonds. It goes without saying you can also opt for a gold pendant with a special shape, like a heart or a butterfly. Which gold diamond pendant would you give to someone as a gift? A gold diamond pendant is, as previously mentioned, also a fantastic gift. You will find a number of unique examples in our flower collection which are both fun to give and receive. The Solé collection, for which designer Elisa Schepens based her designs on the inner strength which helped her after her near-death experience, also includes a beautiful gold diamond pendant. With most of our collections you can order your favourite pendant in yellow gold, white gold, red gold or platinum. Which matching jewellery can I choose? Do you prefer a pendant in gold? Expand your jewellery box with matching earrings, rings and bracelets. If you have decided on a gold diamond pendant from one of our designer collections, you will instantly be able to find all the matching options. The collections therefore also reflect one specific theme. For example, the butterfly is the central focus point in the Monarca designer collection, whilst the Le Paradis collection was inspired by exotic flowers. Let yourself be inspired by creativity and craftsmanship from our own home soil!